Brushing up: Representatives from 40 schools attended Brisbane Catholic Education’s inaugural digital skills training program. 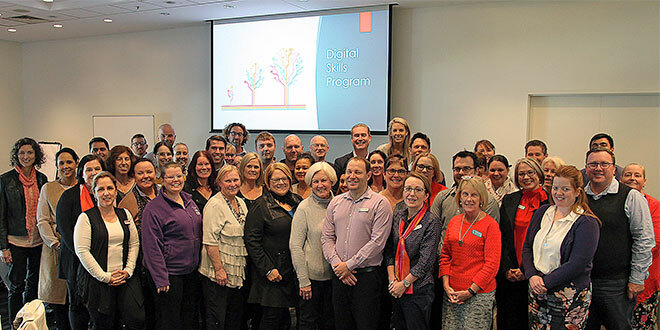 REPRESENTATIVES from 40 schools attended Brisbane Catholic Education’s inaugural digital training program at the Brisbane Exhibition and Conference Centre recently. Earlier in the year, BCE released a major upgrade to its school portals with the integration of Microsoft’s Office 365 suite. As a result, schools highlighted the need for additional professional learning around the use of these products, as well as the need to support the general Information and Communications Technology (ICT) capabilities of staff in schools. BCEO digital skills facilitator Paul Coogans said the program aimed to increase the core ICT skills, personal productivity and digital literacy of classroom teachers. Mr Coogans said a pre-program survey was sent out to each school to assess the level of core digital competency amongst staff with more than 1100 responses received. He said over the three days, representatives from each participating school were taken through workshops on Office 365 products as well as school and parent portals. “On the final day, the results of each school’s survey were examined, and a personalised professional learning plan was developed for each school,” Mr Coogans said. Rochelle Smith, from St Francis Xavier School, Runaway Bay, said she picked up some useful tips on using Office 365 within a school context. “It reaffirmed things I already knew and made me more aware about some things I didn’t know were available to us in schools,” she said. Assistant principal for religious education at St Joachim’s School, Holland Park, Daniel Hodge said he found it interesting that a lot of teachers still needed help when it came to technology competency. He said following the training he would return to school and target those teachers, upskilling them so they did not feel so out of the technology loop. “Then it’s about challenging those teachers who have indicated they know a little bit to keep having a go,” Mr Hodge said. Kimberley Clark, from St Stephen’s School, Algester, said not only would the Office 365 suite help set up students as successful learners, it would also better equip teachers to be more effective in the classroom. “This program has given us some great strategies to implement it in our schools,” she said. Mr Coogans said ongoing support in delivering the Professional Learning plans through Semester 2 would be offered to schools onsite by one of five BCEO digital skills facilitators. He said the delegates finished the three days feeling energised and raring to go in helping to upskill teaching staff in their schools.